Timişoara Opera House is located on Opera Square (today called Piaţa Victoriei). 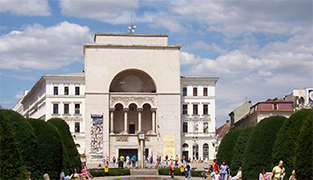 From its balcony, the first free city of Romania was proclaimed in 1989. The building was designed by the architectural office of Helmer&Fellner in Vienna and is unique in its style. In three different languages – Romanian, German, Hugarian – theatre performances are held. Furthermore, operas and ballets are staged as well. The rector’s office of Timişoara’s University “Politehnica” is located on “Corso” boulevard. This boulevard is also called “Lloyd Boulevard”, since the university building was financed by the insurance company Lloyd. As a port city, Timişoara needed insurance for their ships. Löffler Palace, a residential building opposite the university, was named after one of Timişoara’s urban architects. On its façade, one can still see bullet holes from the 1989 “terrorists” who wanted to overthrow Ceauşescu. László Székely was an architect who significantly influenced the cityscape by building houses in Hungarian art nouveau style at the turn of the century. He for example designed the Piarist monastery and the Piarist church. The city’s medical university is a building with historical significance. It was originally built as a teacher training college “Banatia” for Banat Swabians in 1926 and generations of German teachers were educated here. 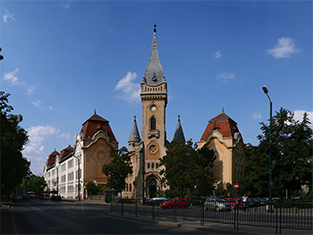 The Piarist church and monastery, one of the prestige schools of the city until World War II, were built by László Székely. The former theatre was built from 1871 to 1875 in renaissance style.